What could be easier than getting meals on the table with a push of a button? Doing it with only six ingredients or less. Forget about loading up the cart with a long list of special ingredients, time-consuming advance prep, and endless chopping and dicing. This book offers no-fuss recipes that complement the Instant Pot’s many settings, for simple, satisfying meals ready when you want them. Recipes include meaty braises, soups and stews, healthy breakfasts (for anytime of day! ), pastas and grains, and more. For even more convenience, one-pot recipes are noted with icons throughout, and some versatile recipes can be made using either the Instant Pot’s pressure-cook or slow-cook function, so you can cook according to your schedule. “Tasty tips” and serving suggestions offer even more flexibility to make the most of ingredients you already have on hand. 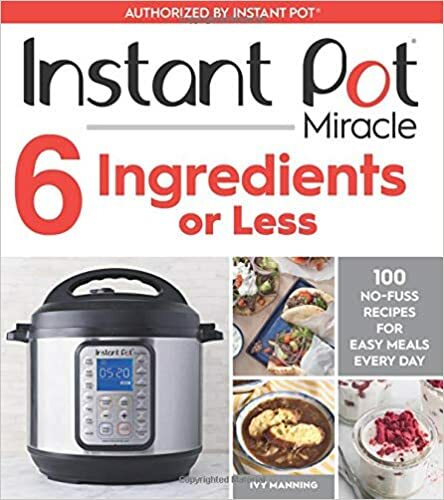 Whether you’re just getting to know your Instant Pot or you’re a long-time fan, this book makes cooking delicious, wholesome meals easier than ever. Order from Amazon, Barnes & Noble, IndieBound, or Powells. The Instant Pot has made getting dinner on the table easier than ever. And Italian food is a perfect partner for your Instant Pot—think rich and meaty braises, one-pot pastas, risotto, stuffed artichokes, and more. This authorized Instant Pot cookbook offers 100 delicious, sure-to-please recipes for weeknight cooking and beyond. Recipes take advantage of the Instant Pot’s many settings, allowing you to perfectly sauté and simmer a variety of dishes with just the push of a button. Long-cooking foods like grains and beans (Fall Farro with Pears and Walnuts, Corona Beans with Tomato and Sage) as well as slow stews and braises (Tuscan Beef Stew, Chicken with Creamy Artichoke Sauce) finish in half the time of stovetop cooking. But other hacks and surprises abound, too—set-it-and-forget it recipes for focaccia, quick pickles, no-oven-required cakes and cheesecakes, and even DIY ricotta. Weeknight Vegetarian shows how to put a delicious, wholesome meatless meal on the table on any schedule. It offers quick, easy, and healthy meatless dinner ideas for any time of the year, with dozens of choices for any occasion. Weeknight Vegetarian shows how to put a tempting meatless meal on the table every night of the week. Using fresh produce, whole grains, vegetable-based protein, and healthy fats as the foundation, author Ivy Manning transforms fresh ingredients into tempting dishes. From granola and beef jerky to graham crackers and kimchi, this inspired volume features more than 60 easy-to-follow recipes for making many of your favorite foods from scratch. In Better From Scratch, you’ll find familiar kitchen staples, exciting new concoctions, and dozens of ideas for satisfying everyday cravings, both sweet and savory. Armed with this go-to guide, you’ll be ready both to stock your pantry with homemade flavors and to turn out unique gifts for family and friends. Whether whipping up your favorite sandwich condiments, fermenting your own sauerkraut, or making beef jerky from scratch, so many kitchen staples, from sauces to snacks, are simply better and more nutritious homemade. This collection of do-it-yourself recipes will inspire you to stock your kitchen with made-from- scratch favorites without the added preservatives, sugar, and unpronounceable ingredients found in similar store-bought products. Organized by savory and sweet items, the recipes span classic to innovative and provide solutions for everyday items, inspiration for new creations, and ways to satisfy salty and sugary cravings. This is the DIY guide to making homemade crackers, with 52 formulas for crisp snacks and the luscious dips to eat them with, all celebrated with 25 playful photographs. Portland, Oregon-based food writer and baker Ivy Manning capitalizes on the pure flavors of whole grains, real butter, cheese, fresh spices, and no preservatives in her formulas for crunchy, sweet, and savory treats, all made to pair with a chapter’s worth of creamy, gooey dips, and schmears. Recipes and tips are for bakers of all skill levels and tastes, with formulas for vegan, gluten-free, and whole-grain crisps. This adorable book is timed perfectly for the cracker-making trend and makes the ideal gift for the baker or entertainer who takes pride in making everything from scratch. The farm-to-table movement is flourishing. Farmers markets and greenmarkets are popping up in cities and neighborhoods across the country. Shoppers are no longer restricted to the same 30 items in the produce section of the Kroger or Safeway. This cookbook invites you try Escarole Caesar Salad, a Dandelion Greens-Italian Sausage-Fontina Cheese Pizza, and Kohlrabi Salad with Pea Shoots. Farmers markets also introduce cooks to artisan cheesemakers, and the recipe for End of Summer Quiche plays up the tangy character of locally made goat cheese. Ivy Manning, cooking teacher, chef, and writer has gathered many of the recipes in her book from leading restaurants in Portland and Seattle that are notable practitioners of fresh local ingredients. Organized by seasons, each section also has an illustrated produce primer that introduces and explains the culinary qualities of spring greens, heirloom tomatoes (summer); pears and (fall), and winter squash. After marrying a vegetarian, meat-lover Ivy Manning developed a collection of recipes that each had a “fork in the road” to a few vegetarian servings of a meaty dish or a few omnivore servings of a vegetarian dish. Over the years, the author has assembled a diverse and delicious array of recipes from cuisines worldwide that are flexible enough to accommodate everyone at the table. Typical entries in this beautifully illustrated cookbook include elegant Japanese Eggplant and Halibut with Miso Glaze, and a sumptuous Spaghetti Carbonara for gourmands of all persuasions. Ivy was the contributor of 25 recipes to this, the Oregonian’s first cookbook in over a century showcases the state s emerging fame as a source for some of the best food grown in America with hundreds of recipes created by great home cooks, the region’s most talented chefs, and The Oregonian’s most popular food writers. In eighteen chapters The Oregonian Cookbook features 360 recipes from appetizers, soups and main courses to vegetables, breads and desserts. Included is a special chapter of recipes from Portland’s most influential and award-winning chefs, including Philippe Boulot, Greg Higgins, Vitaly Paley, Naomi Pomeroy, Andy Ricker, Gabriel Rucker, Lisa Schroeder, Cathy Whims, and many others, plus a special tribute to Portland native and legendary food authority James Beard. Compiled by The Oregonian s FOODDAY editor Katherine Miller, this resourceful new cookbook is one all cooks will want to have, as it features the most popular and frequently requested recipes from FOODDAY ‘s three decades of outstanding culinary coverage in Oregon s largest circulation daily newspaper.